Almost every designer has created a brochure at some point. And there’s a strong possibility you’ll be asked to design another! Whether it’s for a client or to promote your own business, there’s an art to designing a brochure. And then there’s an added challenge: brochure design isn’t just for print anymore. Digital brochures are just as popular as the hard-copy versions. It’s quite common for clients to request a printed brochure with a digital shareable file of the same design. Don’t sweat this design challenge though. We’ve put together some classic and modern tips so you can create a brochure design that looks great, and is easy to read. The first step in creating a brochure design is to consider shape, size, medium, and folds. 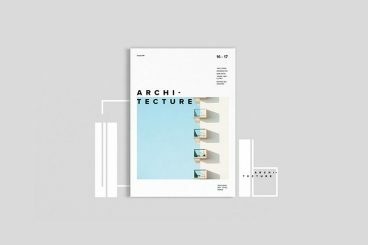 All these tactile properties of brochure printing contribute to the style of design you choose and how combining text, images and other elements comes together. Tri-fold: Three panels on the front and back, stacked vertically or horizontally printed on common paper sizes such as 8.5 inches by 11 inches (or A4) or 11 inches by 17 inches (or A3). Half-fold: This style works best for a mini-booklet style with a front, back and inside spread. Die-cut: Brochures with cut out panels, shapes and styles are often printed on thick stock and come in almost any size. They are characterized by multiple cut elements so that at least some part of the brochure isn’t rectangular. Multi-page: The more pages a brochure has, the more likely it is to become a booklet. These are almost always in a standard size (8.5 by 11 or A4) and include some binding. Square: The shape has become popular thanks to usage online and square designs often include a custom paper size. It can be a little more expensive, but quite attractive. When it comes to shifting a print brochure to digital, consider making each page or fold of the brochure a separate page in the digital version. Order them in the way content should be read. This will make the brochure easier to read regardless of format. What’s great about designing a brochure is that you can get creative with effects and textures. Some trends in brochure design include using high-color options, plenty of sleek typography and simple images. Many of the same things that are popular in other areas of design apply to brochures as well. High color, high image designs can work great and be quite impactful in print also. Just make sure to check with your printer to ensure that colors, images, and bleeds will work well with the paper and printing selections you have made and adjust if needed. A great way to handle a brochure design without a lot of images or other “designed” art elements is with big type. Fun oversized lettering can make a lot of impact and help users know exactly what the brochure is all about. Get creative with type choices and the way you create words. Interesting word breaks for long words (such as on syllable per line), titling, color, and different alignments can add a lot of visual draw to lettering. When choosing to design a brochure featuring only lettering, take care to include plenty of white space and a defined type hierarchy so that the eye travels easily through content. When it comes to printed brochures, less is more. Minimal design styles are popular with brochures because there’s less to worry about when it comes to printing and quality control. Avoid reverse type and you don’t have to worry about the readability of light text on dark backgrounds. Go for a white background or canvas and there’s less ink to worry about smear. Minimal styles give you a little more choice with paper stock as well. You can actually use lighter weight paper when you don’t have as much happening with the overall print job. Finally, minimal design styles are classic and modern. They never seem to go out of style. Ready to get started? We’ve got even more tips to help you create a great brochure design. Or, if you’re short on time, consider starting with a brochure design template! Learn how to design your own brochure templates, or browse collections of the best brochure templates to get started fast on your next brochure project!